The 6th annual fundraiser of the Ontario Employment Education & Research Centre (OEERC), in partnership with the Workers’ Action Centre, is only ten days away! 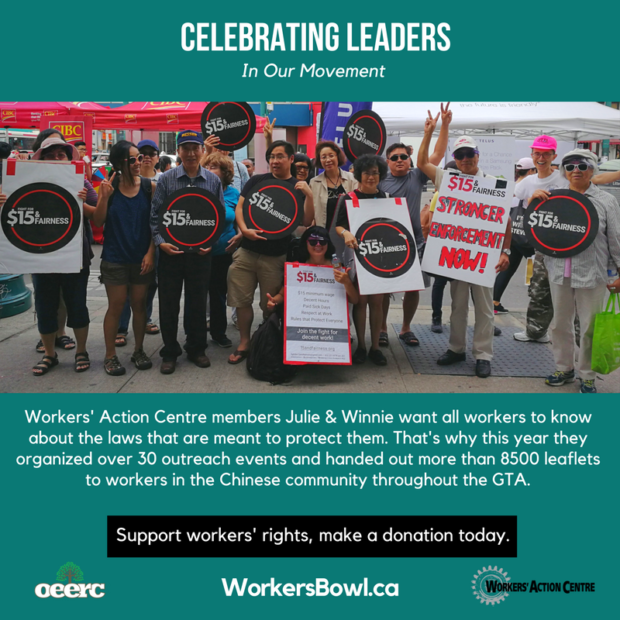 Funds raised through the Workers’ Bowl will help WAC provide workers’ rights workshops in different languages across the Greater Toronto Area, as well as leadership education. In celebration of our movement for decent work, we are sharing the stories of WAC members who champion the rights of workers by doing outreach, sharing information, and supporting workers through experiences of injustice. Please join us in celebrating them, their courage and hard work. Julie and Winnie are two dedicated WAC members, who have experienced unfairness at work. They are now Senior Leaders, having participated in each level of education offered at WAC, and are making a huge impact! Focusing on the downtown Toronto area, Julie and Winnie teach the Chinese community about workers’ rights. They have held over 30 outreach events and handed out more than 8500 leaflets to workers. Many people in their community are newcomers, some with language barriers. Yet it is not uncommon for these two leaders to meet people who have worked in Ontario for decades, but still aren’t familiar with the laws meant to protect them. Winnie and Julie’s ability to share essential workers’ rights information in their languages, and with creative approaches that connect with their community, is priceless. Their outreach addresses common issues in the community, such as questions about whether or not it’s legal to be paid in cash. In this way, Winnie and Julie begin important conversations, create awareness and begin the process of building the confidence of more and more workers in precarious and vulnerable work situations. Sometimes when leafleting they find community members won’t speak with them for fear of getting fired. Instead of giving up, Winnie and Julie creatively dealt with this fear by playing a pre-recorded message about decent work loud enough for all to hear at the Chinese festival where they were doing outreach. We admire the work of Julie, Winnie and other members who are organizing in their neighbourhoods to empower those who face violations in the workplace. You can continue to support the leadership development of precarious workers. Please consider making a donation today to fund educational programs that impact thousands of workers every year. (Tax receipts are available for donations of $10.00 or more.) We also invite you to join us in celebrating Julie and Winnie: Please share their story with your networks.